KUWAIT: By the end of June 2018, the first quarter of the current fiscal year 2018/2019 ended and the average price for Kuwaiti oil for most of June scored US$ 72.1 per barrel, which is US$ 22.1 (44.2%) higher than the new hypothetical price in the current budget at US$ 50 per barrel. It is also US$ 27.1 higher than the hypothetical price for the preceding fiscal year which was US$ 45 per barrel. The past fiscal year 2017/2018 which ended on March 31, 2018 scored an average price for Kuwaiti oil of US$ 54.5 per barrel. The average price for June is higher by about 32.3% than the average price for last fiscal year but is less by US$ -2.9 per barrel than the parity budget price in the current budget which is US$ 75 per barrel according to the estimates of the Ministry of Finance and after deducting 10% for the future generations reserve. Kuwait is supposed to have achieved oil revenues in the amount of about KD 1.6 billion in June. Assuming that production and prices would continue at the current levels -an unrealistic assumption- Kuwait’s oil revenues would score about KD 17.8 billion in oil revenues for the entire current fiscal year, which is KD 4.5 billion higher than the value of oil revenues estimated for the budget at KD 13.3 billion. Adding an amount of KD 1.7 billion in non-oil revenues, total budget revenues would score KD 19.5 billion for the current fiscal year. Comparing this figure with expenditures allocations in the amount of KD 21.5 billion, it is likely that the general budget for FY 2018/2019 would achieve a deficit in the amount of KD 2 billion. However, the actual deficit remains a variable with the movement of oil prices and production during the remainder of the fiscal year. Warba Bank announced results of its operations for the first quarter of the current year, which indicate that the Bank’s net profits (after tax deduction) scored KD 2.92 million compared with KD 1.36 million for the same period of 2017, showing a rise in its profits by KD 1.56 million or by 115%. The rise in net profits is due to the rise in total operational income by a higher value than the rise in total operating expenses. Therefore, the bank’s operating profit rose by KD 3.1 million or by 80.4%, reaching KD 6.9 million compared with KD 3.8 million. In details, total operating income of the bank increased by KD 3.13 million or by 40.4% and scored KD 10.88 million, compared with KD 7.75 million for the same period of 2017. This resulted from the rise in the item of net financing income by KD 2.6 million or by 45.5%, and scored KD 8.3 million versus KD 5.7 million. All other operating income items rose by KD 583 thousand, except for the item of net investment income that declined by KD 59 thousand. Total operating expenses increased by a lesser value than the increase in total operating income by KD 72 thousand or by 1.8%, scoring KD 4.02 million compared with KD 3.95 million. The rise included all items of operating expenses except for the item of depreciation that dropped by KD 85 thousand. Percentage of total operating expenses to total operating incomes scored 36.9% compared with 50.9%. Item of provision for impairment increased by KD 1.4 million or by 58.8% and scored KD 3.8 million, compared with KD 2.4 million for the same period of last year. This explains the rise in the net profit margin to 26.8% in the first three months of the current year, compared with 17.5% for the same period of last year. The bank’s financial statements indicate that total assets increased by KD 60.9 million or by 3.4% and scored KD 1.835 billion versus KD 1.775 billion in the end of 2017. While total assets increased by KD 519.3 million or by 39.5%, in comparison with the same period 2017 when it scored KD 1.316 billion. Item of financing receivables rose by KD 97.4 million or by 7.7% and scored KD 1.361 billion (74.1% of total assets) versus KD 1.263 billion (71.2% of total assets) in the end of 2017. It rose by KD 390.2 million or by 40.2% compared with KD 970.5 million (73.7% of total assets) in the same period of 2017. Percentage of total financing receivables to total deposits scored 83.2% compared with 85.6%. Item of cash and balances with banks rose by KD 32.3 million and scored KD 45.5 million (2.5% of total assets) versus KD 13.2 million (0.7% of total assets) in the end of 2017. It also rose by KD 39.8 million compared with KD 5.7 million (0.4% of total assets) in the same period of 2017. While the item of placements with banks and CBK decreased by KD 81.9 million or by 33.2% and reached KD 164.6 million (9% of total assets), compared to KD 246.5 million (13.9% of total assets) by the end of 2017. It also decreased by KD 24.3 million or by 12.9% compared to the same period of the previous year when it reached KD 188.9 million (14.4% of total assets). Figures indicate that the bank’s liabilities (excluding total equity) increased by KD 59 million or by 3.7% and scored KD 1.657 billion, compared with KD 1.598 billion in the end of 2017. It also increased by KD 513.6 million or by 44.9%, if compared with the total in the same period of last year, when it reached KD 1.143 billion. Percentage of total liabilities to total assets scored 90.3% compared with 86.8%. Results of analyzing financial statements calculated on annual basis indicate that most of the bank’s profitability indexes rose compared with the same period of 2017. The average return on equities relevant to the banks shareholders’ (ROE) increased to 11.5% compared with 5.7%. The average return on capital (ROC) increased and scored 11.7% versus 5.4%. Likewise, the average return on assets (ROA) increased to 0.6% compared with 0.4%. Basic and diluted earnings per share (EPS) scored 0.48 fils compared with 1.36 fils, due to the discount of profit payment on Perpetual Tier 1 Sukuk by KD 2.4 million in the end of the first quarter of the current year. (P/E) scored 122.9 times versus 46.9 times due to the decrease of the basic and diluted earnings per share by 64.7% and the decrease of the market share price by 7.5%, compared to their levels in 31 March 2017. (P/B) scored 1.3 times compared with 1.5. The banking sector comprising 10 banks achieved noticeable growth in its net profits in the first quarter of 2018 versus the same period of 2017. First quarter of 2018 profits scored KD 228.9 million (after deducting taxes and minority equities) an increase by KD 32.9 million or 16.8% compared with KD 196 million in the same period of 2017. The operating profit for the 10 banks rose by KD 34.1 million or by 8.8%, and scored KD 422.8 million compared with KD 388.7 million, prior to the discounting of allocations due to rise in operating income by 12.7% against a rise in total expenses by 16%. The impact was reflected directly on the rise in net banks’ profit. The Kuwaiti banks continued to implement blocking allocations against irregular loans so that total allocations blocked in the first quarter scored KD 165.6 million compared with KD 162.6 million in the first quarter of 2017, a rise by 1.9% and it also increased by 17.4% above the last quarter of 2017 when they scored KD 141 million. Profits of 5 traditional banks scored KD 144.9 million, 63.3% of total net profit of the 10 bank, a rise by 18.9% compared with the same period of 2017. Share of Islamic banks scored KD 83.9 million, representing 36.7% of the 10 bank’s net profits, a rise by 13.3% compared with the first quarter of 2017 level. This indicates that the performance of Islamic banks during the first quarter is growing at a lower rate maybe for the first time. Price to earnings multiplier (P/E) for the 10 banks’ sector calculated on last 12 months’ profits scored 14.8 times, compared with 14 times for the same period of 2017. Return on total assets (ROA) remained at 1.1%, calculated on the last 12 months’ profits. Return on equity (ROE) rose to 9.1% versus 8.5%. 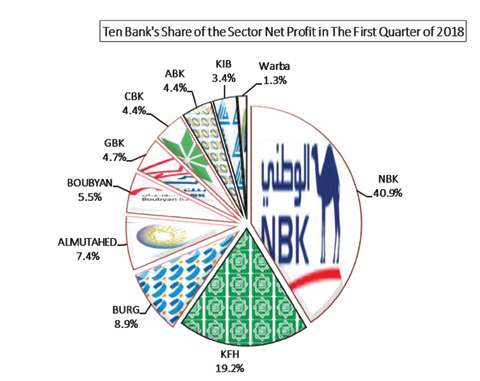 Comparing the performance of the 10 banks, “National Bank of Kuwait” continued to achieve the highest profit value which scored KD 93.6 million (15 fils EPS) or about 40.9% of the 10 banks’ net profits, a rise by 9.6% versus the first quarter of 2017 due to the increase in interest returns and net revenues from Islamic financing. “Kuwait Finance House” achieved the second highest profits by KD 43.9 million (7 fils EPS) or 19.2% of the 10 banks’ net profits and at a growth rate of 13.9% compared with the same period of 2017, due to the increase in net financing revenues, commissions fees and investment revenues. “Commercial Bank of Kuwait” achieved the highest growth in profits by 1167% and scored KD 10.1 million compared with KD 795 thousand, due to the drop in total provisions by KD 12 million or by 42.8%, reaching KD 16.1 million compared with KD 28.1 million in the first quarter of 2017.